If there’s one thing that Singaporeans love doing more than anything else, it’s eating. 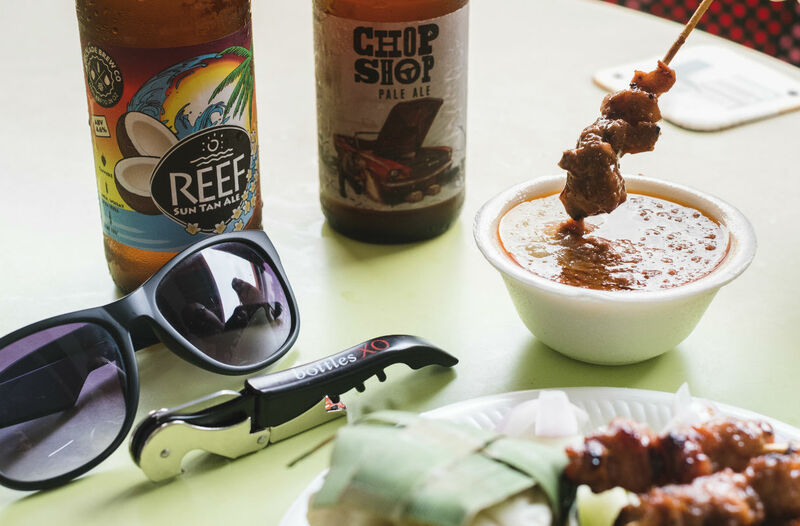 In fact it’s pretty much our national pastime; Singaporeans would easily travel across the width and breadth of the island – and across to neighbouring Malaysia, or even Bangkok and Hong Kong – just to hunt down the best places to eat. But while Singaporeans have a pretty cosmopolitan appetite and have eaten far and wide, we do have such a soft spot for own local hawker food. One of the more interesting trends we see at the hawker centre in recent times is how patrons are beginning to bring their own alcoholic beverages to the hawker centre to pair with their hawker favourites; whether it is wine, sake, craft beer, or even cognac, food and alcohol pairing is now a thing.So we thought, why not come up with a simple hawker food and craft beer pairing guide? 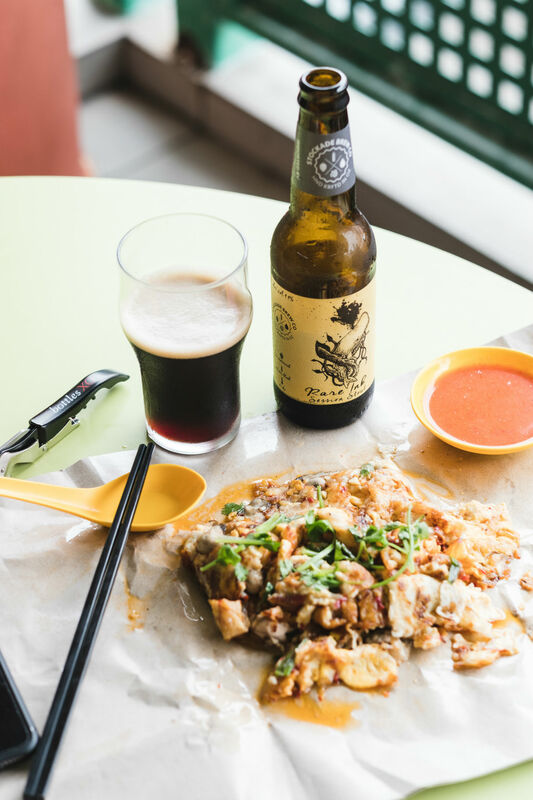 We collaborated with the folks from Thirsty Work – the Singapore distributors of Sydney, Australia-based craft brewery Stockade Brew Co – and alcohol delivery service BottlesXO to work out some Singapore hawker food and craft beer pairings for your gastronomic pleasure. Now the trick to pairing beers with food is understanding the different flavours offered by both food and the beer. Food can be sweet, spicy, sour, and salty, and in the case of many Southeast Asian cuisines you may find all of that – and more – in a single dish. It’s likewise with beer; beers can be bitter, sweet, and roasty, and with more adventurous craft beers they can even be spicy or sour! Take the iconic Singapore hawker favourite of chicken rice, for example. The taste of the poached chicken is actually very delicate, with most of the flavour in the dish coming from the savoury rice or from the condiments with the sweetness of dark soya sauce, and the spiciness of the ginger, garlic and chilli dip too. A good, clean lager here works wonders for a number of reasons. For one, its effervescence and crispness helps to cleanse out your palate and won’t drown out the poached chicken. Sure you can simply wash that all down with any commercial lager you find in a hawker centre, but you can amp up the pairing with the Stockade Duel Hoppy Lager – we find that the tropical aromas from the Australian hops add a level of flavour complexity to the union, while the additional bitterness helps to cut the richness of the dish. Stout and Orh Luak (Oyster Omelette). There’s a very good reason why the British have traditionally washed down oysters with copious amounts of stout – they’re a very natural and delicious pairing! The brininess of the oysters are simply the perfect foil to the roasted creaminess of a good stout, so why not try a more local version with orh luak, or oyster omelette? But forget the usual export stouts you normally find in the hawker centre which can be overly bitter and high in alcohol and so tends to overwhelm the delicate flavours of the shellfish; instead what you want is something like the very sessional Stockade Rare Ink Stout, which comes with a pleasantly dry finish that helps to cleanse out the usual oiliness in the dish. India Pale Ale with Char Kway Teow. Then there’s the sinful hawker staple that is char kway teow. The fried noodle dish is mostly sweet and savoury, replete with some level of wok char (especially if dished out by a true master). 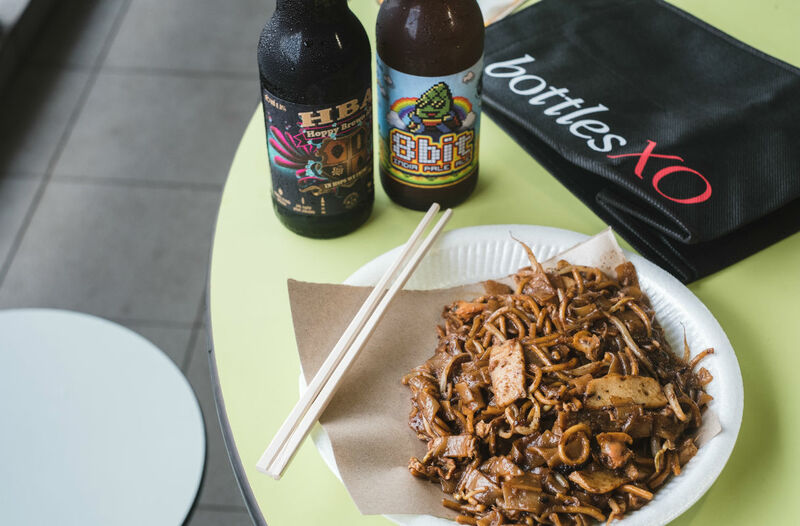 Char kway teow’s robust flavours means you need a beer style that can stand up to that intensity, and that’s where an India Pale Ale comes in. The India Pale Ale is one of the hoppiest styles in the beer world, which means it can be rather bitter but also comes packed with massive flavour and aroma. You’ll be grateful for that bitterness; it will help you to refresh your palate. The Stockade 8BiT IPA, for example, is an American West Coast style IPA with its hoppy characteristics, but is balanced by a strong malty backbone that actually complements the wok hei (wok’s breath) of char kway teow. If you really want to boost that charred note though, try the seasonal Stockade HBA Hoppy Brown Ale instead with its strong roasty, nutty notes. It may be too overwhelming for some, though – you’ve been warned. Pale Ale with Bak Chor Mee. Ask any Singaporean who’s been away for any period of time which hawker dish they miss from home and the answer is almost always bak chor mee. There’s something really addictive about these noodles, which are tossed in a sauce that’s generally savoury, sour, and spicy at the same time. Here’s where we admit pairing bak chor mee is a tricky endeavour; depending on where you get it this noodle dish can come in many forms and flavours. But that’s why a Pale Ale works; it’s the Merlot of the beer world. There’s a decent sweet maltiness to offset the sourness from the black vinegar in the sauce, and not too bitter that it makes the chilli overly spicy (unless you enjoy that kind of searing experience). The Stockade Chop Shop Pale Ale fits the bill here. 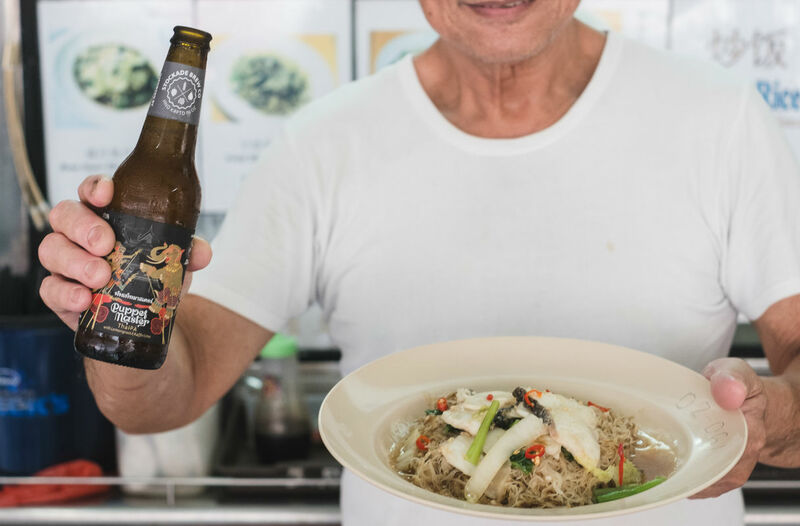 An interesting experiment you can try is to pair bak chor mee with the seasonal Stockade Two Bridges Passionfruit Session IPA – we find the tropical fruit notes from the beer complements the dish very well. Pale Ale with Fried Beehoon. Stirfried beehoon (thin rice noodles) is a favourite zichar dish amongst Singaporeans that’s generally eaten during dinner or supper. It usually comes stirfried or deep fried and then smothered in a rich gravy – with seafood, beef or fish slices – that soaks into the noodles, creating a gooey, delicious mess. We also like a Pale Ale with this dish, although we prefer one that is less malt-forward, and more grassy and herbal from the use of the right hops or other flavour additions. The Stockade Puppet Master ThaiPA, a limited edition collaboration between the Australian brewery, Full Moon Brew Works from Thailand, and Melbourne-based Thai eatery Cookie, has slight tangy and spicy notes from lemongrass and kaffir lime that really works with the flavourful gravy in this dish. Golden Ale and Fried Hokkien Mee. Unless you smother it with copious amounts of sambal chilli or lime juice, the flavours of Fried Hokkien mee can actually be quite delicate. There’s the flavour coming from the light prawn and pork broth that’s used to infuse the noodles, and then there’s wok hei from skillful frying to impart that deliciously smoky note. 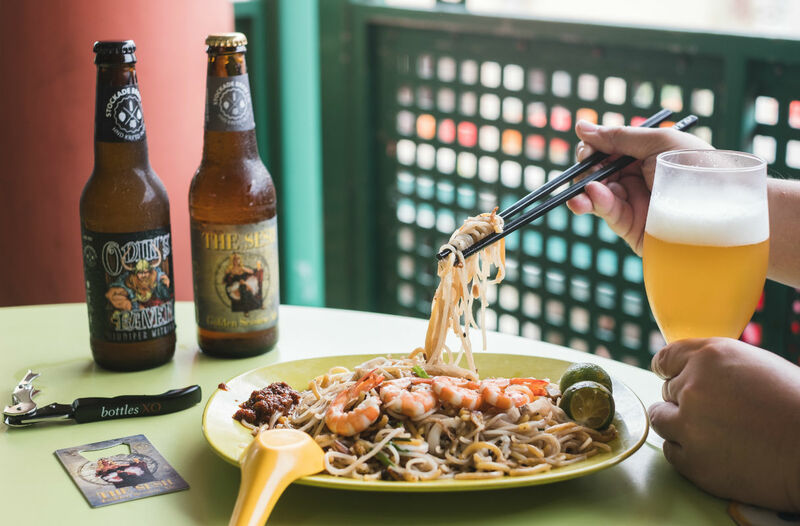 You don’t really want beers that are too strong when it comes to pairing with fried Hokkien mee, and that’s where a Golden Ale comes in. The Golden Ale is essentially a light, blond ale that’s just as chuggable as a pilsner but tends to be less bitter and a little sweeter. The sweetness of a golden ale, such as the Stockade The Sesh Golden Session Ale, helps to round out the savouriness of this noodle dish and the natural sweetness of the prawns. Alternatively, try it with the limited edition Stockade Odin’s Raven – the juniper infused witbier does the same job as The Sesh, but also adds a light herbal note to the mix. What can we say, we love satay and we think almost any beer goes swimmingly with it. We’re talking about marinated meats that’s strung on sticks and then lovingly grilled over a charcoal fire for one of the most amazing beer foods known to man, after all. Feel free to experiment here, as we did. We thought both the Stockade Chop Shop Pale Ale and Stockade 8 BiT IPA worked pretty well if you don’t go overboard with the peanut sauce; for a rather interesting if bizarre pairing try the limited edition Stockade Reef Sun Tan Ale with its very strong coconut flavours. If you’re reading this and wondering how you can get into this whole craft beer and hawker food pairing thing without too much of a hassle, one good way is to check out BottlesXO; they carry almost the full Stockade Brew Co range, as well as wines and spirits, which you can easily order off their mobile app. 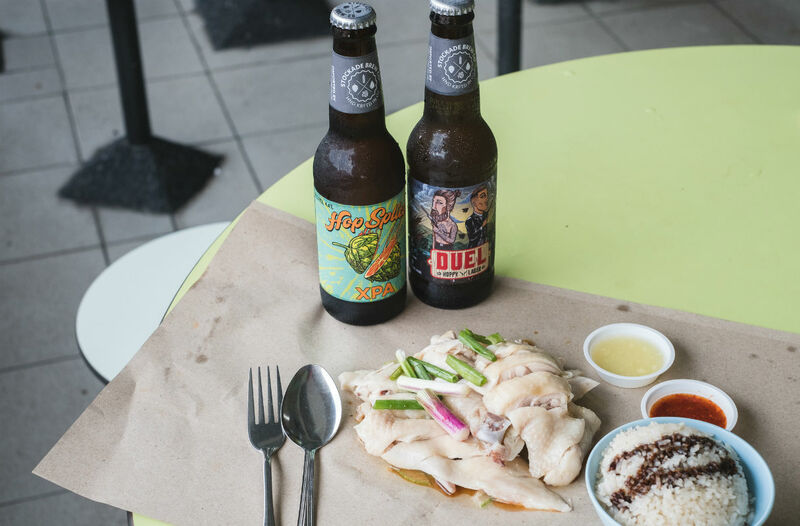 They even promise to get the beers to you under an hour – with delivery till 12 midnight on weekdays, 2am on weekends – so they’ll likely arrive at your doorstep they same time you do when you dapao your food from the nearby hawker centre! 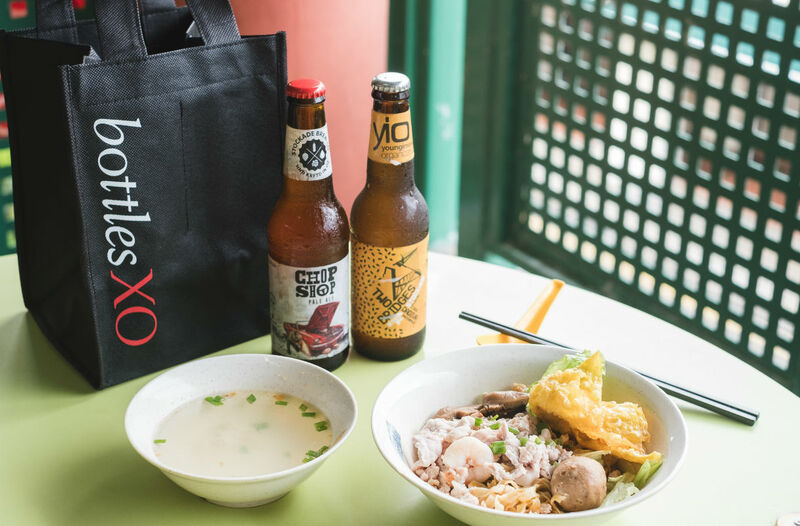 To help you get into the craft beer and hawker food pairing spirit, simply key in CNYBXO during checkout for $10 off your first order on BottlesXO specially for Spirited Singapore readers, just in time to kickstart Lunar New Year festivities.